In the October school holidays teachers from Revesby Heights, Michael Justin and Andrew Finch, visited Jubilee Catholic Secondary School (JCSS) in Port Moresby, Papua New Guinea. During their visit they conducted lessons and spent time with the local staff by providing professional development on pastoral care and other initiatives. Michael and Andrew were graciously hosted by the De La Salle Brothers at the Bomana Community where yet another De La Salle school is established and thriving. During their visit, they were fortunate to attend as guests while the school celebrated "Teacher's Day." Michael and Andrew said that they felt very blessed to share so many wonderful experiences both in and out of the classroom. The experience has been described as humbling, thought-provoking and extremely uplifting. Students in PNG live in a very different reality to the students in a Sydney suburban school such as Revesby. 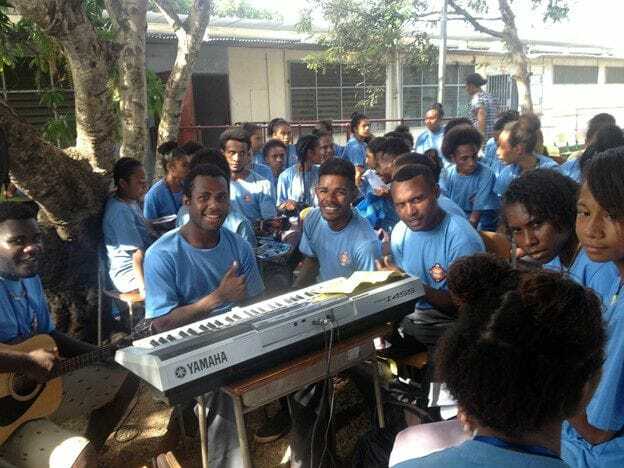 Their reality includes poverty (difficult to comprehend, as Australians we know very little of the life of the average Papua New Guinean) and yet students in PNG achieve high academic results and go on to further study and develop careers. Students are rarely, if ever absent, and there is a tangible sense of community and care for one another. A former student who now teaches at JCSS used the term "LOOK SAVE" (pronounced 'look sarve') which refers to the way that they acknowledge and respect other members of their community both past and present. Michael and Andrew saw a great need for clothing and basic school equipment for students. Upon their return to Revesby, they decided to partner with Bethany College at Hurstville to run a collection drive for needed items. The drive was a huge success and between the two schools they managed to collect enough suppliers to fill 120 boxes. These boxes were then transported to the container at De La Salle Caringbah, which will soon be shipped to PNG. The work from the SRC members at both schools and the Lasallian Youth Leaders at De La Salle Revesby were partial to the success of the collection drive. Well Done everyone, this was an outstanding effort! The Revesby teachers would like to express their deep appreciation for the opportunity to participate in the volunteer program. They feel they gained far more from the experience than they gave.